Red Cap Guarantees: One Family. Many Guarantees. This is John Gennaro, owner of Red Cap Plumbing and Air. I have good news for you: If you live in Tampa or the surrounding areas, you're part of our family. And since you're family, we'll treat you like family. If you're not 100% satisfied with your comfort system after a year, we'll remove the system (within 30 days of your request) and cheerfully give you a refund. If your new equipment fails to keep you comfortable, we will make unlimited attempts to resolve the issue for up to 3 years from installation. If we cannot resolve the issue with the existing equipment, we will replace the equipment with a new system of equal value at no additional charge to you. 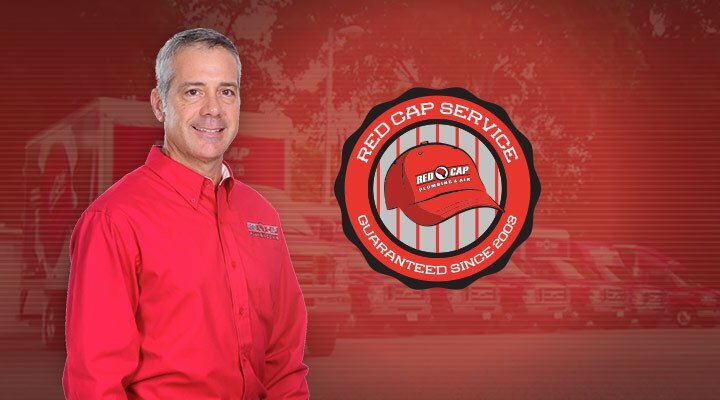 We guarantee that every Red Cap team member is clean, neat and professionally trained. We also guarantee that every employee has undergone a background check that includes mandatory drug testing and an extensive, independent criminal background check using a third party employee verification system called Ask The Seal. If a product that we install fails within the specified time frame for that product, we will replace the entire unit – not just the component. We guarantee that our Red Cap AC Pros will never cut corners to get your job done. That means we will never compromise the quality of the job or your safety with any of the services we provide—regardless of what it costs us. We do it the right way, every time. We guarantee that our team will respect you, your family, your home and your time as if it were our own. How? By putting booties on their feet, laying drop cloths and wearing gloves when needed. Providing this type of care helps us avoid mishaps or accidents that may otherwise occur. However, in the event that an incident does occur, we guarantee that we will quickly accept responsibility and make it right. We never want our customers to wait on protection, so we act as quickly as we can to handle any warranty issue you may have. We guarantee that you will get no games with the prices we offer, no surprises on the service we deliver and no tricks when it comes to your bill. When we give you a price, we honor that price—guaranteed. When we outline a service or repair, you will get precisely what you are promised. We value our customers' time. That’s why, when we give you a window for an appointment, we guarantee we will be there. If we don’t show up in that time frame, we will pay you $100.